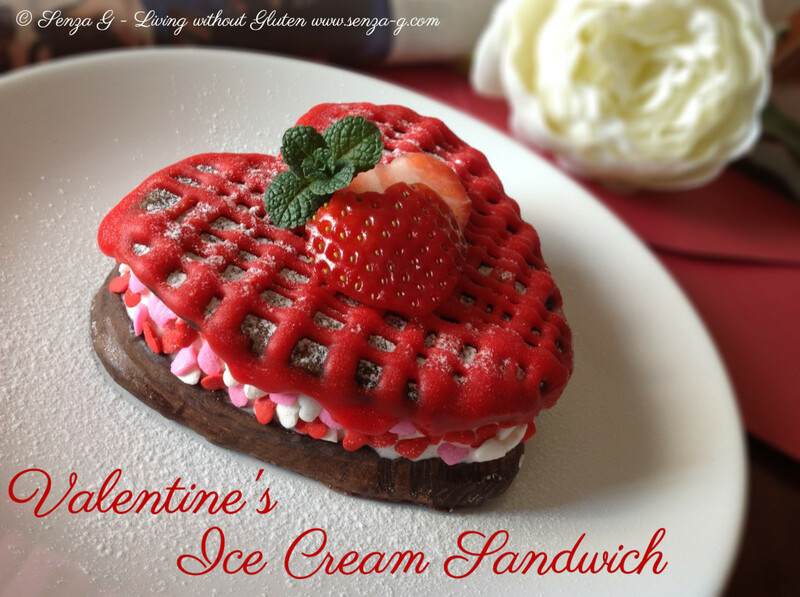 A must for someone who loves cookies and ice-cream! This is not really a recipe with exact weights but more instructions on how to make it. I have used the same recipe for the chocolate rice flour and almond flour Carnival Mask cookies, http://www.senza-g.com/carnival-mask-cookies/ this time cutting the dough into heart shapes. When the biscuits cool, melt some chocolate and cover the biscuits with the chocolate. I found it really easy by using a silicon brush and ‘painting’ the cookies with the molten chocolate. Place in the fridge so the chocolate hardens. I have used Panna Ice-Cream but you can use whichever flavour you wish. Just take out the ice cream from the freezer and let it soften. Take out the cookies from the fridge and put a dollop of ice cream on one of the cookies. Place the other cookie on top and squeeze lightly so the ice cream will spread to the edges. Using a knife, dipped in warm water, run it along the edge so the ice cream layer will be neat. Roll the ice cream sandwich in sprinkles so it will adhere to the ice cream and put it back in the freezer to set. In the meantime, prepare some icing, tinting it red with gluten free food colouring. Put the icing in a small plastic bag and snip the corner. After about an hour, take them out again and ice the top cookie with lines and then across again. Put back in the freezer again. Before serving, dust with some icing sugar and garnish with heart shaped strawberries and a mint sprig.